The iconic LA race gets a brand new app this year, including a radio feature powered by Feed.fm. 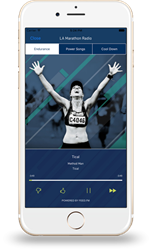 The Skechers Performance Los Angeles Marathon launched a brand new app experience this year, powered by Fitbit, which includes handpicked radio stations by Feed.fm. The radio feature gives people access to thousands of tracks to motivate better workouts. The partnership is aligned with the event’s objective of providing a best-in-class experience for both runners and spectators. Feed.fm provides a legal solution for brands, apps, and teams to better connect with their customers through music. Many people intuitively listen to music while training, but it’s more than just a background soundtrack. In fact, music is practically “a type of legal performance-enhancing drug,” according to Dr. Costas Karageorghis, a world renowned researcher on music for performance and author of over 100 studies. Despite the well documented positive impact on workouts, music has traditionally been challenging to incorporate into mobile experiences due to licensing and technology complexity. Feed.fm solves that problem with custom music curation, fully licensed tracks, and an easily integrated white label solution that allows brands to share music directly with their customers. “At Feed.fm, we are focused on the intersection of music and business and we help our partners connect authentically with their customers. Music triggers visceral reactions in people and is a necessity while working out. We’re excited to help bring dynamic and personalized music to support this iconic race,” said Jeff Yasuda, CEO and Co-Founder of Feed.fm. In addition to training music, the redesigned 2017 Skechers Performance Los Angeles Marathon app powered by Fitbit allows runners, spectators and the entire Los Angeles community easy access to runner tracking, race information, the course map and social media tools to enhance their experience . The annual Skechers Performance Los Angeles Marathon continues to rise to prominence as one of the largest marathons in the country. Atmosphere is a big part of the Skechers Performance Los Angeles Marathon, with bands, DJs and entertainers striving to make the day memorable. With the latest app update, the music and memories come alive digitally as well. Conqur Endurance Group, a subsidiary of McCourt LP, creates world-class experiences that ignite passion in athletes and connect communities through the transformative power of sport. The Skechers Performance Los Angeles Marathon is among the largest marathons in the country with more than 25,000 participants, thousands of volunteers and hundreds of thousands of spectators. The “Stadium to the Sea” course, starting at Dodger Stadium and finishing near the Santa Monica Pier, is one of the most scenic in the world, taking runners on a tour of Los Angeles past every major landmark. In addition to the marquee event, Conqur Endurance Group produces the Santa Monica Classic 5K/10K, the LA BIG 5K and recently added the Pasadena Half Marathon & 5K at the Rose Bowl. For more information, please visit http://www.goconqur.com. Feed.fm helps brands leverage music to connect with their customers. Music impacts shopping behavior, drives lasting memories, and drives brand affinity. Feed.fm works with top brands including Skechers Performance Los Angeles Marathon, American Eagle Outfitters, Shazam, Toys “R” Us, and The Golden State Warriors to power mobile web and in-app music solutions. Customers listening to music are, on average, 2x more likely to convert to a purchase in a mobile app. Based in San Francisco, Feed.fm is funded by Crunchfund, Core Ventures Group, KEC Ventures, and Fyrfly.